In this work, samples of St52 steel were plasma nitrided using an iron screen, in an N2: H2 gas mixture ratio of 4 : 1, at 500 and 550°C for 5, 10 and 15 h. The X-ray diffraction and optical microscopy methods were used for structural characterization of the coatings. Results indicated that the coatings were composed of Fe2–3N and Fe4N phases growing at longer deposition times. Moreover, the Fe2–3N phase was decomposed to Fe4N after 10 h of plasma nitriding. 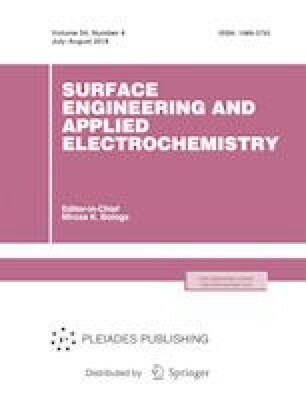 The erosion–corrosion behavior of nitrided coatings and a bare substrate were studied in various impact angles: 30, 45, 60 and 90 degrees. Polarization curves of the coated and uncoated samples were recorded between–900 to 600 mV, as a function of the slurry impact angle. Results showed that an active screen plasma nitriding method significantly enhanced the erosion–corrosion resistance of the St52 steel. Moreover, an impact angle of 30° on the sample surface yielded a lower weightloss whereas increasing the impact angle up to 90° caused more weight-loss due to the brittle characteristic of iron nitride coatings. According to SEM micrographs, by increasing the impact angle up to 90°, the depth of the removed mass increased substantially.